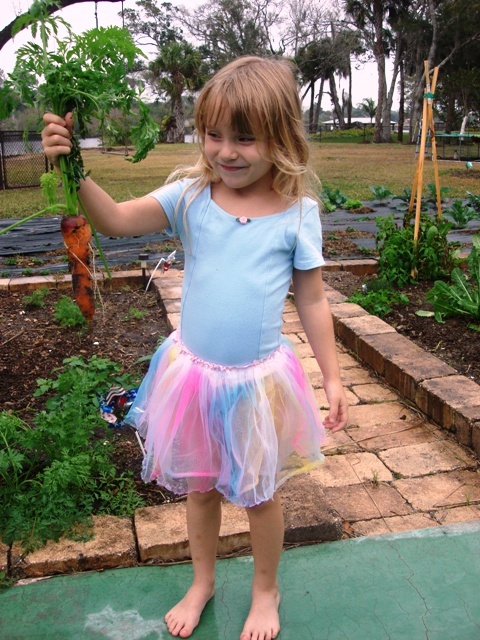 My daughter and I harvested a row of muscade carrots this morning. They are absolutely crunchy and delicious! They would have been even sweeter if I hadn’t waited so long to pull them, but they are still worth writing about. I ordered the seed packet from Baker Creek Heirloom Seeds. According to them, the muscade carrots are a North African variety and rare. Harvesting carrots. My daughter dresses herself in her favorite outfits every morning. You never know what the day will bring. The muscade carrots are a large carrot variety. They have a delicious texture. After we harvested the muscade carrots I realized they are really large carrots. I figured they would be good juicing carrots. When we tasted them we decided there’s no way we would juice them. They’re way too good. We will enjoy them uncooked and crunchy. My kids won’t eat carrots when they’re cooked, but they’ll eat them all day long if they’re raw. (Especially when they grew them.) I was the same way when I was a kid. We take the tops off the carrots and rinse them with the hose before we bring them inside. 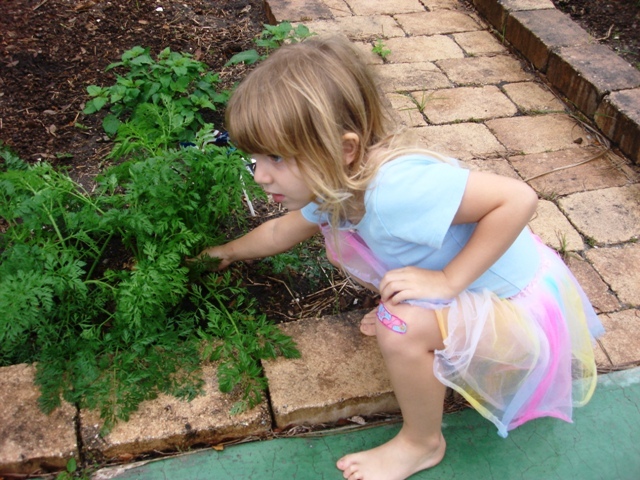 We cut the green, leafy tops off the carrots and feed them to our bunnies. The leafy tops are toxic to people but very nutritious for the rabbits. A few years ago, I put our harvested carrots in the refrigerator without cutting off the leafy tops and I found them all soft and inedible the next day. I wondered why the carrots from the grocery store lasted so long in the fridge. I learned that when the green tops are cut off, I can store my carrots in my refrigerator for several weeks. 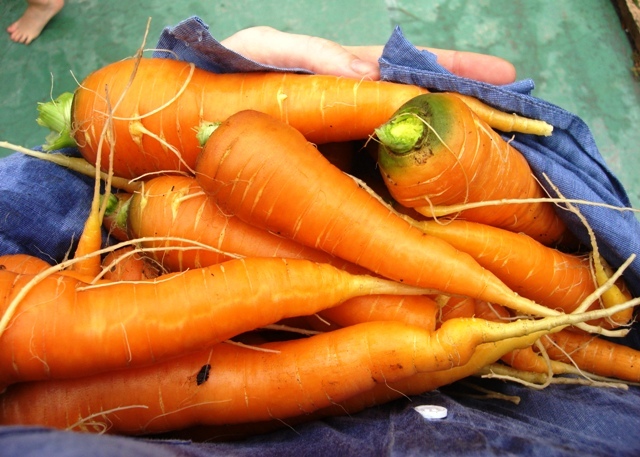 Click here for a link on storing carrots through the winter. All the muscade carrots we can carry. We’re in zone 9b, so we don’t even attempt to grow carrots in the summer here. Carrots get bitter and bolt in hot weather. (Cold increases their sweetness.) However, we grow them every year during our fall and winters. We find them very easy to grow. Gardens Alive sells an organic heat tolerant variety called Danvers 126. 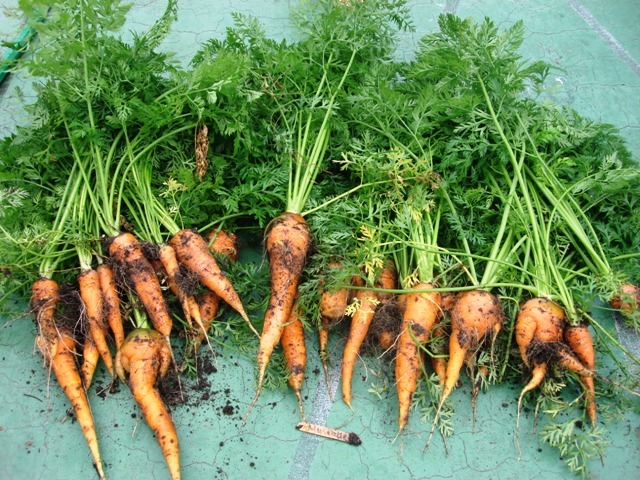 We plant our carrots about 3-4 weeks apart so we’re not harvesting a million carrots all at the same time. We find it interesting and fun to grow different varieties. 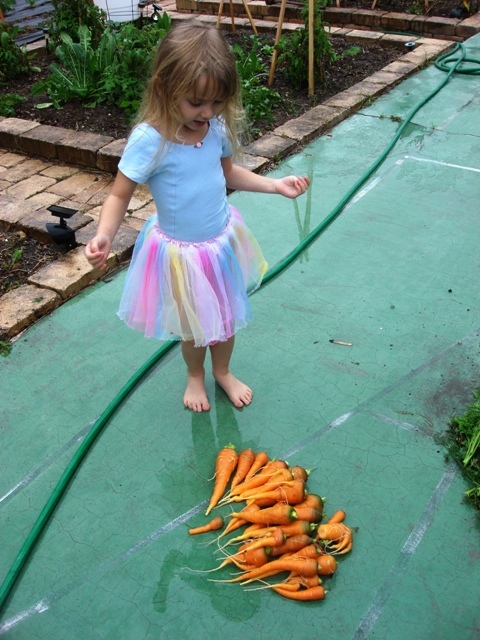 It’s priceless to pull a carrot fresh from our garden, rinse it in the hose and walk around our yard crunching on it. Back to nature! 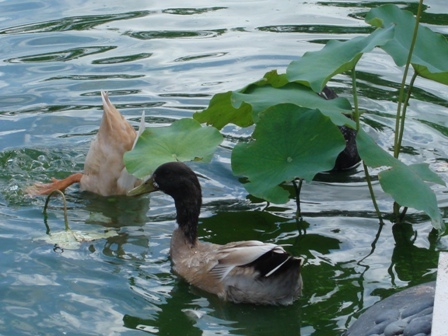 We’ve decided that it isn’t such a big deal that our three ducks are eating our lotus. I have extra lotus growing in pots, so we’re not going to worry about it. 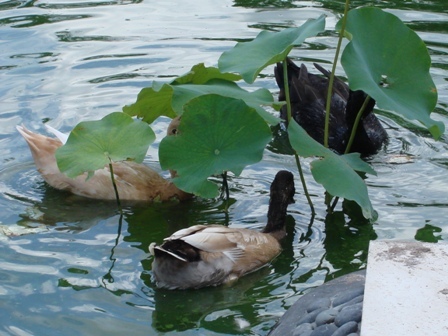 The lotus spreads fast and easily… and we kinda like our little Indian Runner ducks. They are playful, amusing and ooooh so entertaining. 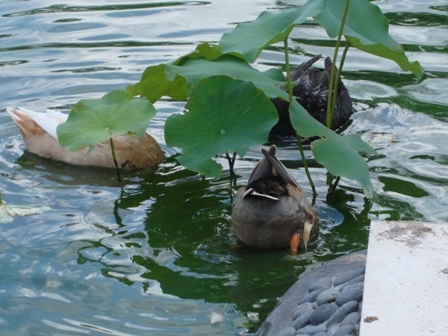 Our three ducks feasting on our lotus. They dive down to get to the roots. Duck butts in the air is a frequent sight around here. The lotus flower blooms for several days after which the petals fall off leaving a seed pod for new growth. The seed pod is frequently dried and used in dried or fresh flower arrangements. Our lotus flower in bloom.This is the lotus flower after the petals have fallen off. 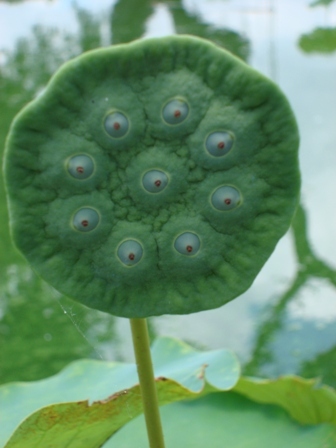 The lotus seeds are inside. The round, raised areas have seeds inside. 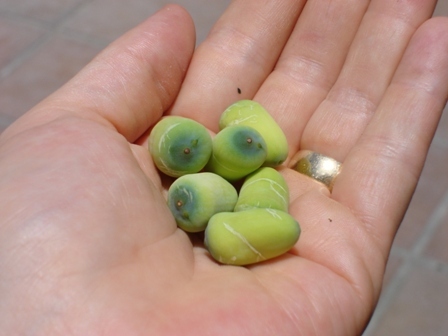 These are green, unripe lotus seeds that have a rubbery texture. The seeds can easily be dug out with your fingers when they are ripe. They are tough to dig out when they are still green. My Vietnamese friend said that in Vietnam they eat them fresh as a snack when they are ripe. She dug the seeds out of one of the pods in my pond to show me. It wasn’t a green pod like in the picture above, but it wasn’t a completely dried pod either. It was “in-between”. She was able to easily pull the seeds out. She didn’t chew up the seeds, she just sucked on the jelly that surrounded the seed. We tossed the seeds back in the pond to see if they’ll germinate. The lotus seeds are a common food in Asian cuisine. There are a lot more uses than what I’ve described. Grayson and I plan to learn more about the uses of this ooooh so cool seed. Grayson and I couldn’t wait to try some lotus root (it’s actually a rhizome). We just had to know what it tasted like. 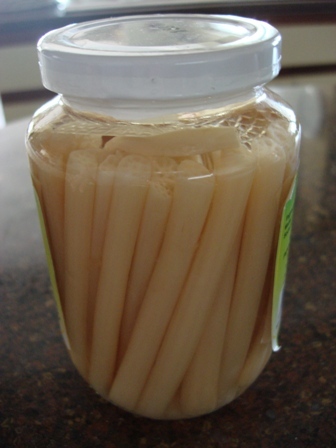 We bought a jar of pickled lotus root at a nearby Indian market. When we took a bite, we both noticed that it had long “hairs” in it. At first I thought somebody’s stray hair got into the jar, but Grayson quickly realized that is what the lotus root is made of… hair-like strings. It didn’t have any flavor. I think it’s one of those foods that has to be cooked with insider knowledge to taste good, like tofu. I would love to try it again sometime, but next time I want to try it fresh, not pickled. Fresh lotus root would be much larger than the pickled root that we bought. I found a great website called Just Hungry that has more information and a good recipe. 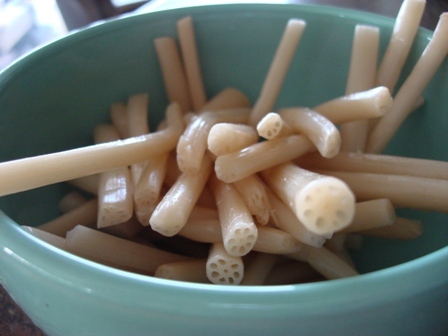 I also found a blog called Albany Eats that has some great pictures of fresh lotus root. The leaves of the lotus are edible as well. In Asia, the leaves are picked when young. They are boiled and eaten as a vegetable. 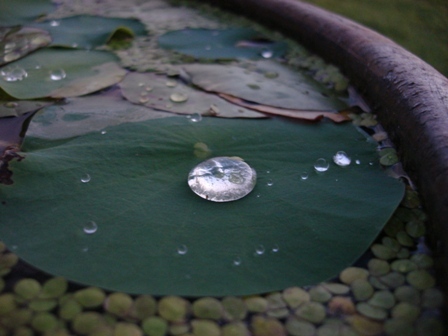 Lotus leaf with a water droplet. I took this picture at dusk. It really moved me. Lotus turns brown and dies back in the cooler months. It goes dormant and then pops up in the spring and summer when it’s warm. It doesn’t require any removal when it turns brown unless you want to remove it completely. If you want to keep your lotus, I find that it’s best just to let it be when it starts to turn brown. American Lotus (Nelumbo lutea) is native to Florida and grows wild in many places. The rhizomes were a source of food for the American Indians. 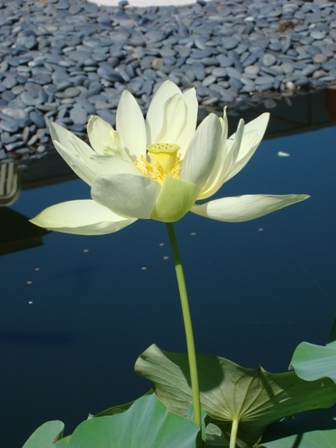 It is another species of lotus and is different from the Asian lotus (Nelumbo nucifera). However, the whole plant of both species is edible. Pickers used to harvest and sell the American lotus from Lake Okeechobee. An article from The Palm Beach Post in July, 1987 said that pickers would get $35 for a bin full of pods. A pod that was dried as an ornament in a flower arrangement would get 50 cents each. In Lake Okeechobee, the lotus shades out and kills the noxious hydrilla weed and it doesn’t jam boat propellers. It also provides a ton of fish habitat. The plant that gives and… gives. We love our beautiful lotus in our backyard water garden. People either love it or hate it. 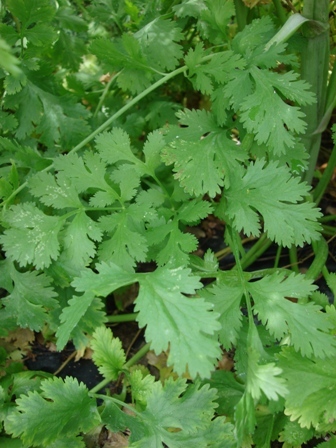 I’m talking about cilantro (Coriandrum sativum). Cilantro is pronounced [sih-LANH-troh] and it is the leaves and stems of the coriander plant. The dried fruits of the plant are called coriander seeds and are usually referred to as a spice. The dried fruits (coriander seeds) have a warm, nutty flavor when they are ground up or chewed. 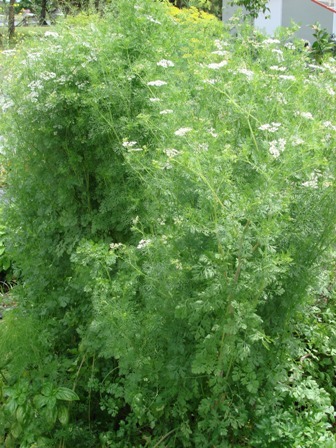 Coriander was found in the tomb of Tutankhamun of ancient egypt, so it’s been around for quite a while. The leaves taste like soap to some people. Julia Childs hated it and wanted nothing to do with it. The NY Times did an article on cilantro and offered a theory that some people are genetically inclined to dislike it. My husband used to hate it and has learned to tolerate it. I absolutely love cilantro and find it full of wonderful flavor. I love to add it to salsa and chopped avocado. I also love it sprinkled over pineapple gazpacho soup that I make in the blender. I sprinkle it over my own meal so my husband has the option to leave it out of his meal. Coriander seeds taste very different from the leaves. 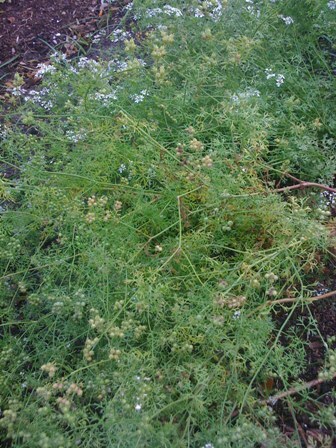 When the coriander plant bolts and gets lots of flowers on it, the flowers will turn to seed. The seeds will be green and immature at first. 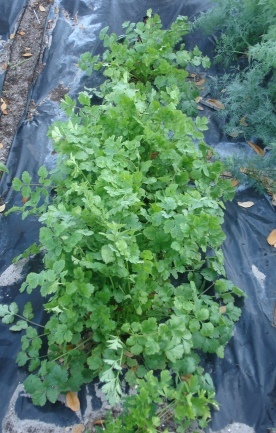 If they are allowed to dry on the plant, they will turn brown and then can be picked and harvested as coriander seed. Our coriander seeds from last years harvest. One plant filled the entire jar. We are still eating from them. We will have lots to give away this year. 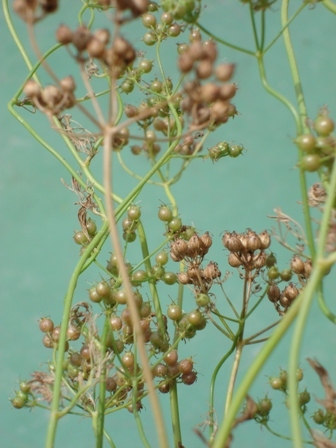 Coriander seeds are used extensively in India. They use it as a thickener as well as a spice in their cuisine. The seeds are also roasted and eaten as a snack. Indians use it medicinally as a relief for colds by boiling the dried seeds in water. 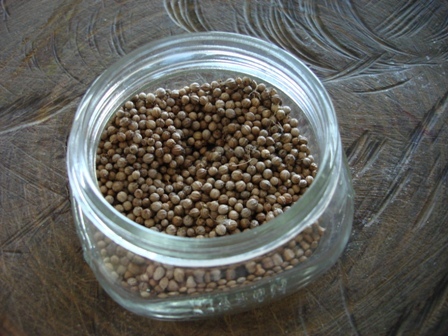 In Germany, they use coriander seeds for pickling. A beer is brewed in Belgium with the seeds and paired with orange peel for a citrus flavor. The entire plant is edible. 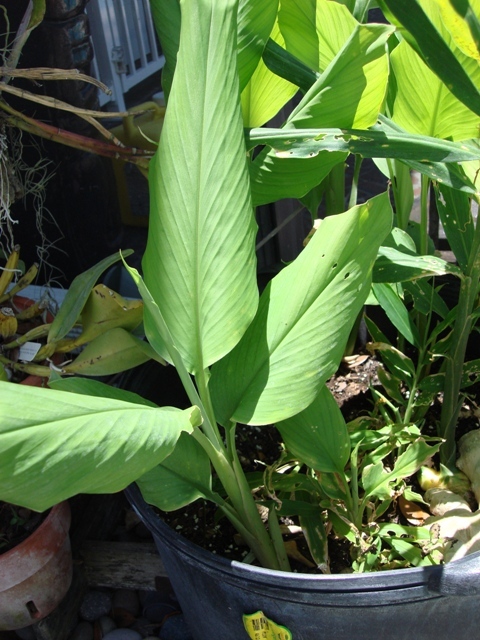 The roots are used in soups and curries, especially in Thai cuisine. The roots cook quickly and should be added last in the cooking process. The roots are a favorite ingredient for many chefs. 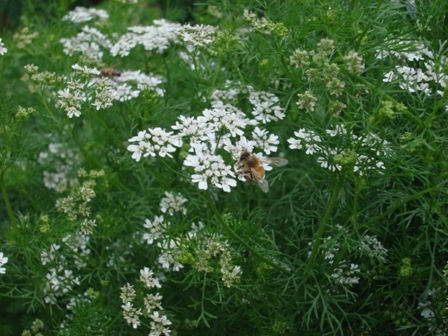 Flowering Coriander...the Bees Love it. Cilantro is a cool weather herb. When the roots reach 75 degrees, the plant will flower and go to seed (bolt). However, if it’s grown in a pot it could be moved into a cooler spot in the summer. Extra mulch helps it stay cool too. 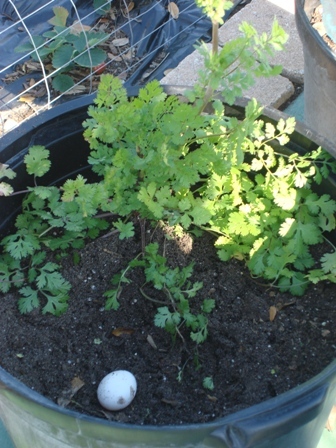 This summer we are going to try a couple of experiments so we can have our cilantro through the summer…hopefully. The plant is ready to harvest after 8 weeks when it’s grown from seed. The plant has a longer growing season if the flowers are cut off. If you let the plant go to seed, it will re-seed itself around your garden. We have coriander plants popping up in the most unusual places and we just let them grow. Cilantro growing in an oversized pot. A chicken is using it as a nest. Cilantro tastes wonderful with avocado, pineapple, lentils, mayonnaise, peppers, onions, garlic, tomato, tomatillo, salsa, yogurt, and ice cream…just to name a few suggestions. I found a cool recipe for cilantro ice cream at veglicious.blogspot.com and a recipe for an avocado cilantro ice cream at makelunchnotwar.blogspot.com. There is a great soup recipe at about.com with coriander, carrot, and ginger. My favorite recipe with cilantro is a pineapple gazpacho soup that I make in my blender. The ingredients are: 4 cups chopped & peeled cucumber, 4 cups chopped pineapple, 1 cup pineapple juice, 1 small jalapeno pepper (no seeds), 1 scallion (green onion), 1 tablespoon lime juice, 1-2 teaspoons salt, a bunch of cilantro leaves, 3 tablespoons of extra-virgin olive oil and a few chopped nuts ( I like macadamia best). The soup should be chunky, so I don’t blend it too much. Since my husband doesn’t love the cilantro, I only add it over the top of my soup and I don’t put it into the blender. I change the recipe sometimes by substituting ingredients. It’s great for lunch in the summer on really hot days. My daughter loves the flavor of cilantro and my son does not. However, they both love to harvest the seeds. Most people in the U.S. have only tried water chestnuts from a can. I never thought much of them until I tried a fresh one. They are a common Chinese vegetable that keep their crunchy texture and sweet flavor when cooked. They’re fat-free and have lots of potassium and fiber. We are lucky in Florida to be able to grow them and enjoy them fresh. 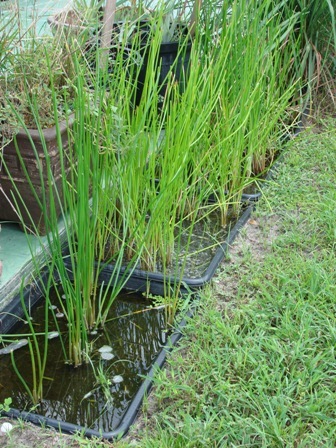 The water chestnut (Eleocharis dulcis) is quite easy for the backyard gardener to grow , but they need seven months of frost-free weather for their growing season. The water chestnut is an aquatic vegetable. 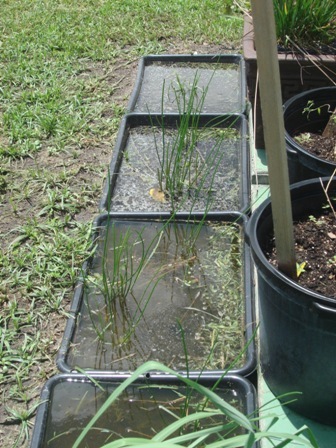 I always keep an inch or two of water in the containers I grow them in. My chestnuts are growing in inexpensive concrete mixing containers I purchased at Home Depot. I dug the ground out a little so the containers would sit in the ground. I let duckweed grow around the plants which makes the containers look pretty. It does splash out of the container when it rains, but then it seems to grow back overnight. Did you know that duckweed is edible too? I would have to be really hungry to try it. Maybe that is a culinary experience that should be left to the domestic animals and fish. The water chestnut plants spread easily. It is only necessary to start with a small plant in each of these containers. 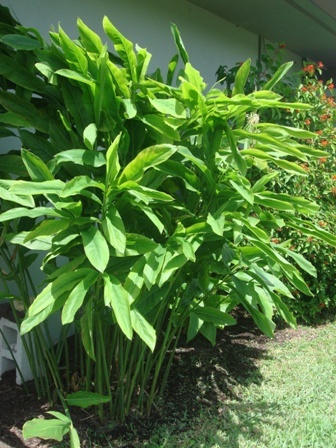 The one plant will produce many more and give you a large harvest of fresh water chestnuts. 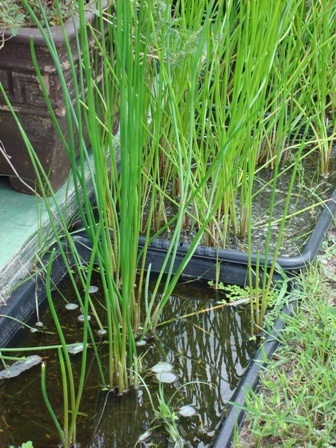 The plants are mature after six weeks of planting them. The green tops will turn brown and die off. They are to be left in the water with the brown tops for two to three weeks and then harvested. To harvest the corms (tubers), you have to dig your hands in the muck and feel around for the round corms (water chestnuts). We actually had a really fun time doing this. 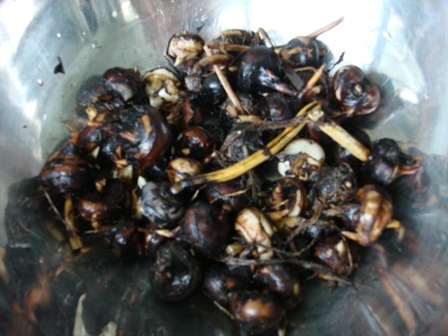 It’s a good idea to leave one or two of the corms in the muck for the next growing season. I found my water chestnut starts from a place called TaDeGe in Ft. Lauderdale. We have visited this place several times and ordered stuff from the website. The guy that runs this business has introduced us to so many cool plants and fish. We’ve bought monster snails, wakin, gorgeous lotus, tiny shrimp, water lilies, and water chestnuts from him. His website is educational, full of humor and just plain fun to look at. In the late 1980’s, Florida researched the possibility of making the water chestnut into a viable Florida industry. It didn’t work out because the corms are hand-harvested which made the cost of labor too high. The water chestnut was introduced into the U.S. in the 1930’s. In 1988, the U.S. imported 25,000,000 of them. 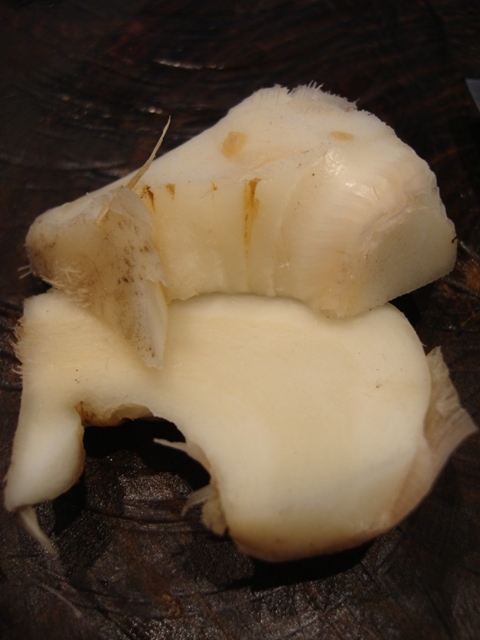 To prepare the fresh water chestnuts, the paper-like brown skin has to be peeled like a potato. There are many recipes for them, but the most common way to eat them is in stir-fry. We just peel them and devour. They haven’t made it to the frying pan in our household yet. They are sweet, crispy, and fresh with a fruity flavor. I think they taste like a coconut. My kids love them too. With all the freezing weather we had in our zone 9b this year, I wasn’t sure what to expect of our water chestnuts. I never let the containers dry out through the winter and I found lots of sprouts today. I did a little happy dance. They made it. I love Thai cuisine and I love to cook it. 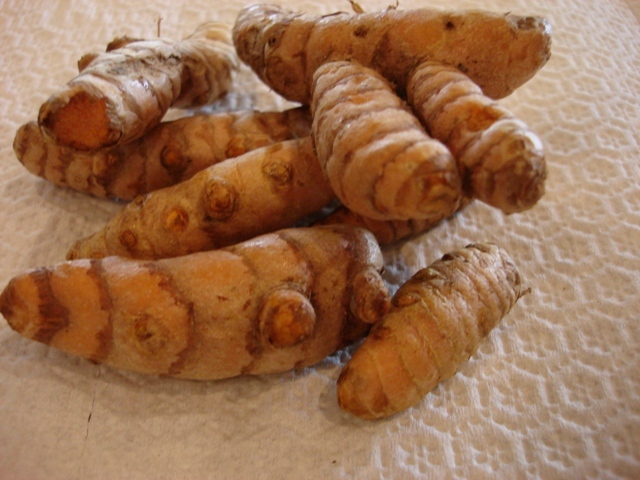 Greater galangal is a basic ingredient in Thai food and is sometimes referred to as “Thai ginger”. I always see the gnarly galangal rhizomes in the freezer in Thai markets. I’m so thrilled that I am able to grow it in my own yard. 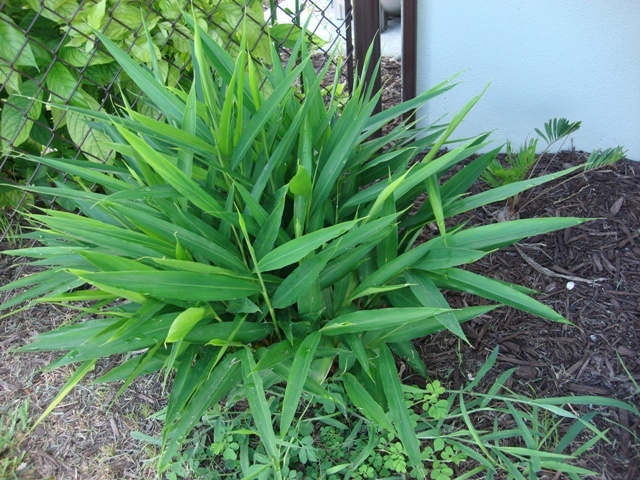 The plant in the picture above is about two years old and is about six feet high. 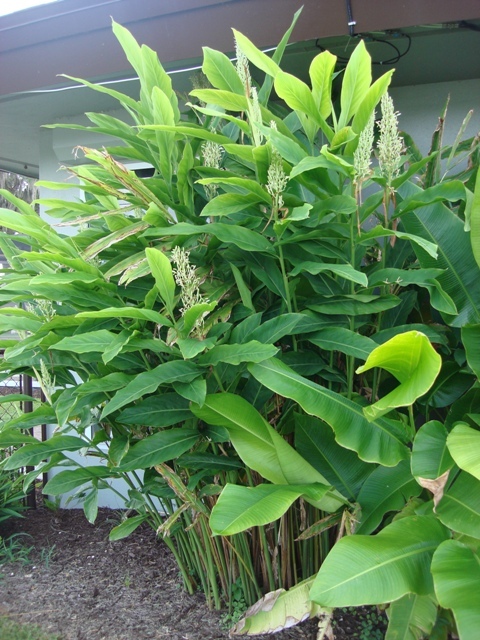 I expected the worst for this tropical ginger with the freezing temperatures we experienced this winter in zone 9b. I didn’t expect this beautiful plant to survive, but I haven’t even had to cut it back . It has some browning around the edges of the leaves and that’s it. It did have some protection from frost with the overhang of the house, but it’s planted in a spot that gets really cold. I am in love with this plant. 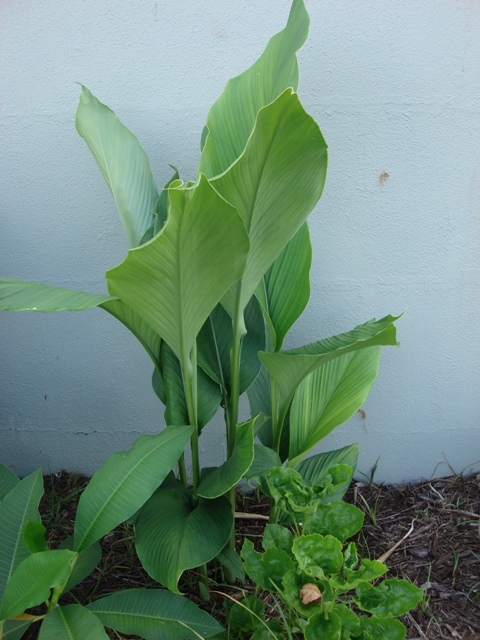 Greater galangal (Alpinia galanga) is in the ginger family and is an edible ginger. 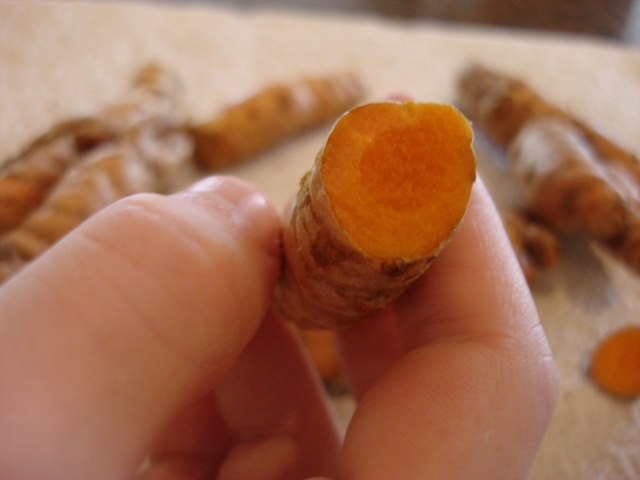 Galangal has been popular since the middle ages. It is especially wonderful for indigestion. It is also used to alleviate nausea, colds, flu, fever, bad breath, diarrhea, and poor blood circulation. I have also heard that it removes toxins from the body. In Southeast Asia, a tonic is made from a mixture of galangal and lime juice. Russia uses it to make liqueurs and India uses it to perfume deodorant. 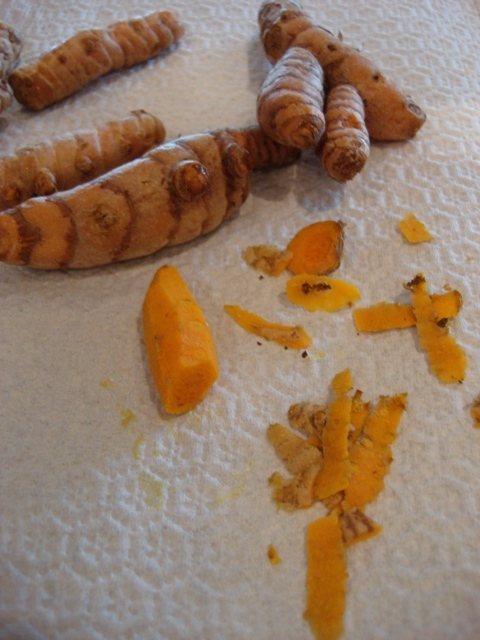 I like to slice mine into big chunks and make “galangal limeade”. A little goes a long way. I harvest mine the same way I harvest my other edible gingers. I dig my knife into the soil and cut off chunks so as not to harm the growth of the plant. As far as flavor goes, it has its own unique flavor. It is spicy like ginger, but it is sweeter and more aromatic in my opinion. 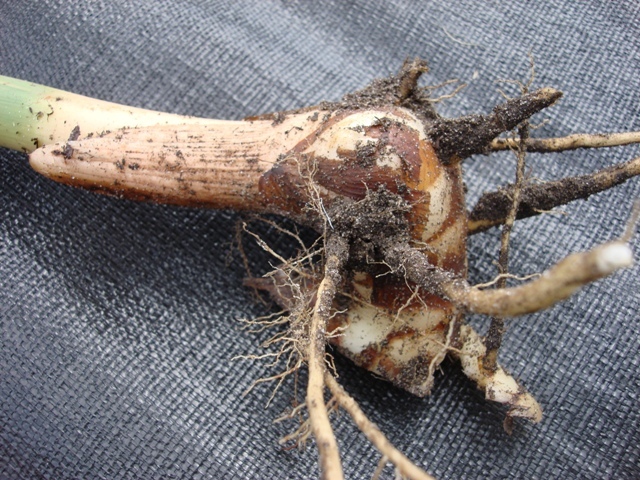 The rhizome is very firm and white on the inside. I have been harvesting mine while they are still young and I like them that way. I have heard that some people harvest the rhizomes when they are mature at about 4-5 years of age. 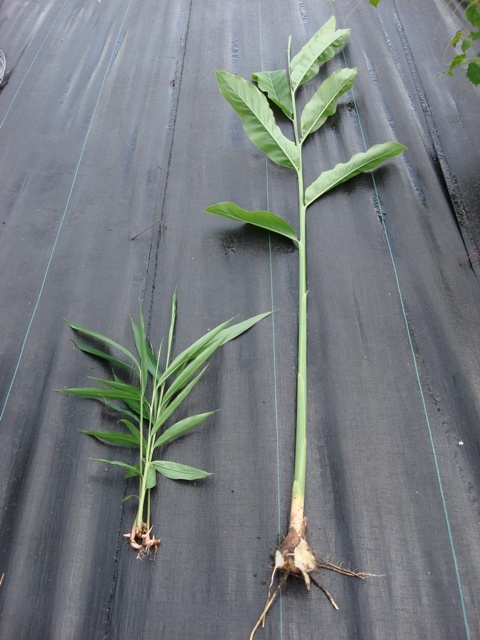 The plants can be started from a fresh rhizome the same way as the other edible gingers and thrives in the shade. I’ve seen the fresh rhizomes in a few Asian markets. 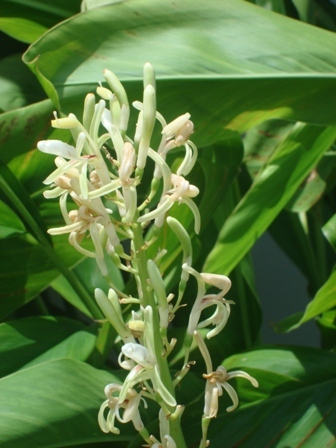 Greater galangal is a lovely plant and produces sweet, orchid-like flowers. 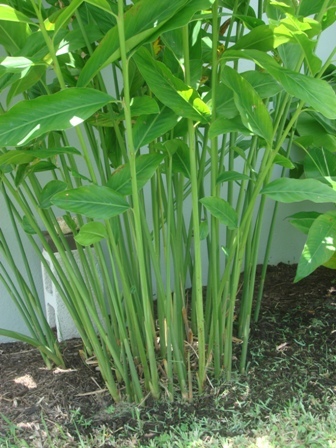 I have another type of galangal growing in my yard as well. 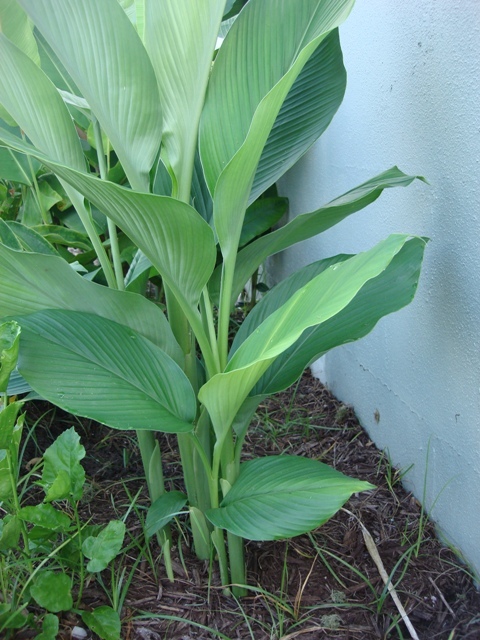 It’s called lesser galangal (Alpinia officinarum). 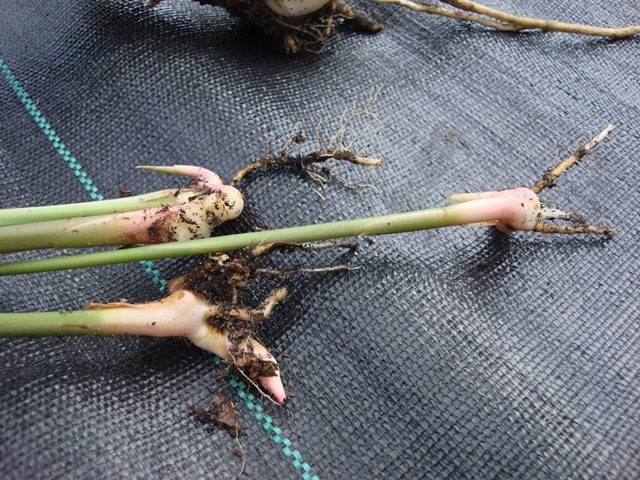 I will write a separate post on that one and include pictures of the harvested rhizomes from both of my galangal plants. The harvested rhizomes from all the edible gingers freeze well. The whole rhizome can be kept in the freezer for up to a year in a ziplock bag. There is no need to slice it up or peel it before you freeze it. When we need fresh ginger, we just grate off what we need with a grater, peeling and all, then return the rest to the freezer.